Bring your message, in your own words to our loyal readers – the area’s top leaders and decision makers. Through branded content posts, you can leverage the PBN brand and audience by telling your story in your own words and positioning your company as a thought leader in your industry. Our aim is to provide a platform where you can share original content, showcase your company’s expertise and capture prospects by building engagement. We offer several programs to best suit your needs. Contact your account manager or advertising@PBN.com / (401)-680-4800 for more information on pricing and formatting. 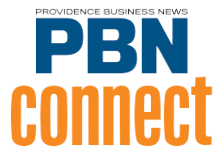 Publicize and showcase a job change, promotion, accomplishment or appointment to the RI and southeastern Massachusetts business community through PBN Connect. Your announcement published on PBN.com within 24 hours (Monday-Friday) and archived on our site. Your announcement featured on the home page of PBN.com and the PBN People on the Move page. Your announcement printed in the next available edition of Providence Business News (as space allows). Your announcement featured on one PBN Daily Edition newsletter, with a link to your announcement on PBN.com. 1 photo, 90-100 words of text, clickable links to your website, social media sharing and keywords to optimize search. Publicize your news through our trusted brand. PBN produces the most business-focused news of any local media outlet. Share your company news on our high-traffic site. Your press release published on PBN.com within 24 hours (Monday-Friday) and archived on our site. Your press release featured on the home page of PBN.com and the PBN Connect Press Release page. 3 photos, approximately 1,000 words of text, clickable links to your website, social sharing and keywords to optimize search.